So… this time I’m not making any promises or even suggestions that I’ll start writing here on any regular basis. Apparently that’s just not going to happen. However, I just finished a fun project that I wanted to share. 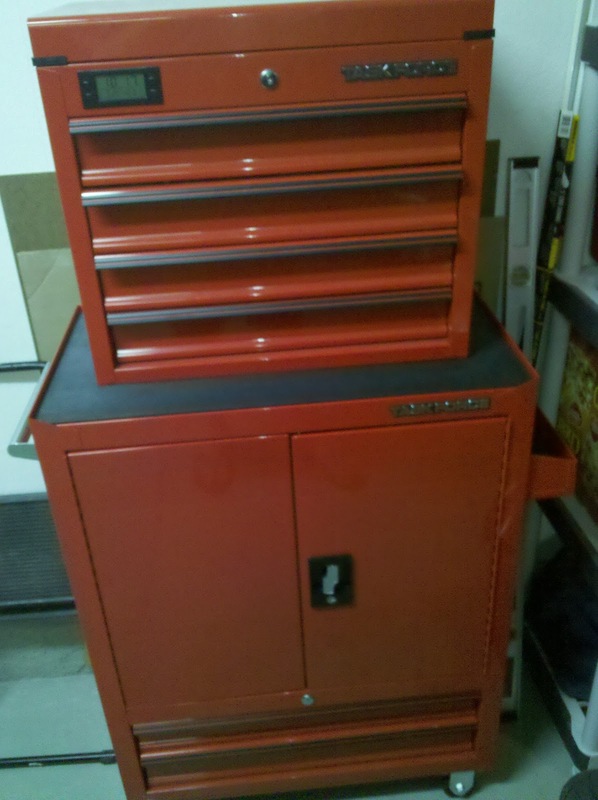 This one is a bit out of the norm for me – instead of computers, this one involves lumber, saws, drills and bolts! 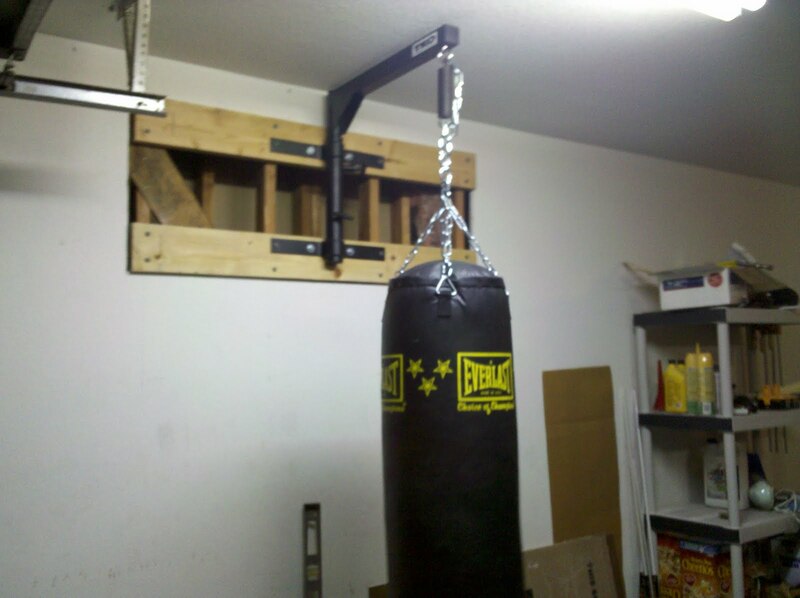 Megan and I have both wanted to have a punching bag available to beat on for a long time (I remember having a conversation about it in the condo in Goleta, so we’ve been discussing it for at least 2.5 years). Well, she finally got tired of waiting on me and bought a big 80 pound bag. Funnily enough, however, just having a bag is just the start – we didn’t really enjoy using it while it was lying on the ground or propped against a wall! And so began the project. I did some research, shopped around, and eventually decided that I wanted to mount it on the wall using this wall mount. Some additional reading convinced me that I also needed a heavy bag spring and a bag chain and swivel. A couple days later I received my items and was ready to go. When everything showed up, I was pretty excited to get started on the project. So I immediately ran to the local hardware store, picked up a couple 2x4s and some bolts and washers. 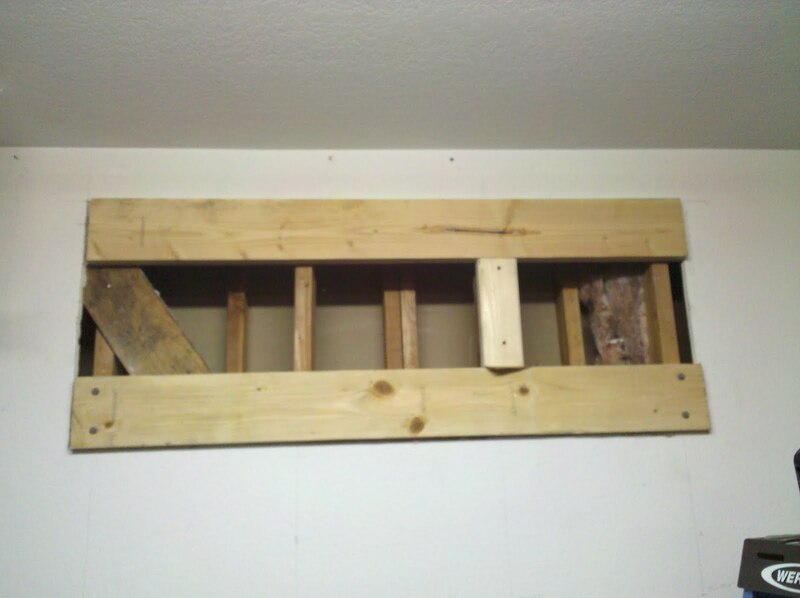 I cut the 2x4s to 52” so they would span across four studs (at 16” apart each) and mounted them parallel to one another for the wall mount to be mounted on. 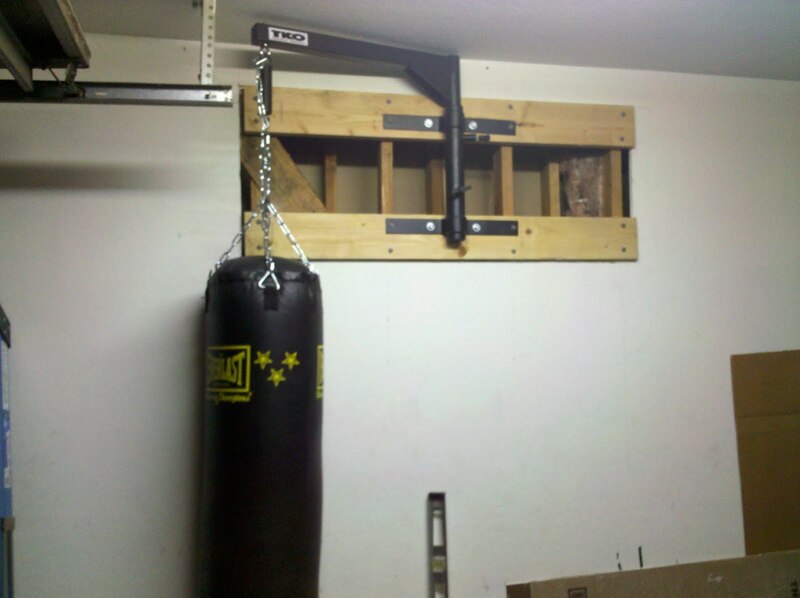 Unfortunately, I either pre-drilled the holes to large, or was plain unlucky, because three of the bolts refused to stay put properly, and when the bag was mounted, the weight of it's swinging was pulling the 2x4s away from the wall. Ugh. I needed to try again. Back to square one. The second time, I got more serious. I decided that I didn’t want the sheetrock between the studs and my lumber, and I wanted bolts made specifically for this kind of attaching. 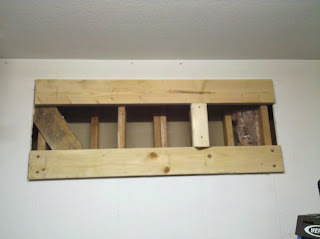 Also, I wanted 2x6s instead of 2x4s so I could fasten the lumber with pairs of bolts instead of single bolts. 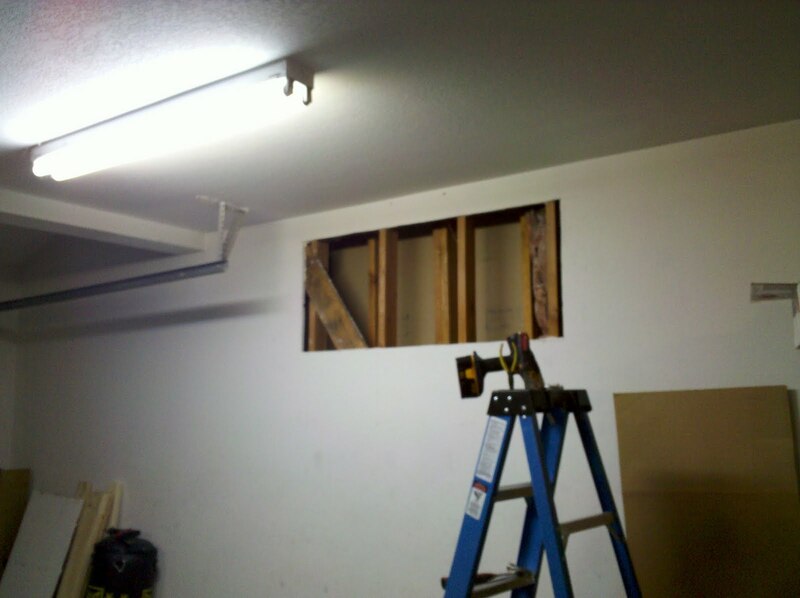 Cutting into the drywall was a new thing for me, but it was fairly simple once I had a decent drywall saw (which I learned I needed only after I broke one of the blades for my sawsall). At this point, I realized that pictures would be nice! Up close and personal with the hole in my wall. After the hole was done, it was time to add the lumber. The bottom one was pretty easy -- I had a 1/2" of drywall to rest the board on. The top one was a bit trickier -- I had to get creative and cut a bit of one of the old 2x4s to serve as a brace. 2x6s mounted with a small brace wedging the top board in place while I screw in the bolts to hold it. Finally, I was ready to re-mount the wall mount for the bag. This was also pretty tricky, as the mount itself weighs 15-20 pounds and its really awkward to hold and I was working by myself. So I got clever again -- I laid the mount down on a piece of cardboard and traced it, marking where the holes for the bolts were. 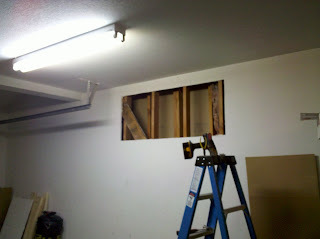 Then I used this template to put some small drywall screws in place that the mount could hang on temporarily. At that point it was a simple matter of removing one screw at a time and drilling the real bolt into place for the mount. The bag hanging on its own. Finally! And here's the bag in it's "resting position", folded away to the side. 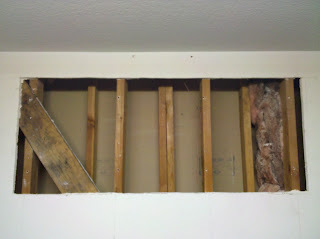 I managed to save the majority of the drywall I needed to remove, so I'll use that to replace the middle section. I also plan on painting the boards to match the wall at some point. All that finish work is going to wait for a while though, so I can keep an eye on the mounting as we start using the bag, just in case. Very impressive project. It's like a large scale Warhammer conversion (or at least that's as close as I can get to relating to it). Ha - that's pretty funny. I think a big Warhammer conversion is a lot harder than this was!